Wednesdays the dental team and eye team drive the Tenwek bus out to rural health dispensaries for outreach. The dental team provides extractions of diseased teeth and the eye team screens for cataract and glaucoma. 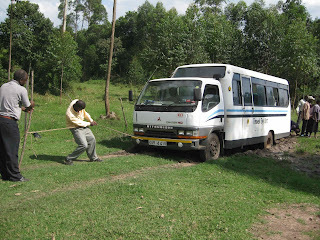 Last week after a successful trip (we saw over 25 grateful patients) our driver choose a different route back to Tenwek. As you can see the bus got stuck. We pushed, Leonard (our dental technologist) pulled, we dug out tires, we placed rocks under the wheels--all without luck. We prayed and down the road came a tractor with a chain. We were back on the road. The next day I gave a lecture on Dental Triage--and suggested before we can do outreach to patients, it may be the dental team that needs to be reached out to in the first place. Ah, prayer is such a good tool, eh?!!! We will lift up your travel routes in prayer each day also.